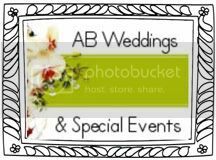 A veil bride wants to keep her wedding veil on throughout the reception. Veil brides see the hairstyle as secondary; it's necessary only as support to help pouf up their veil. No matter which category you fall into, you'll want to choose a veil and wedding hairstyle that best highlights your face. When searching for hair and veil styles, a good rule to keep in mind is "opposites attract." If you're lucky enough to have a DIAMOND- or OVAL-SHAPED face,congratulations -- you're perfectly symmetrical, so your choices areunlimited, as long as they complement your gown, neckline, andproportions. A ROUND, full face will benefit from a veil that falls along the sidesof the face, thus working to help narrow it. As for your wedding hair:Wearing your hair down or in a face-framing bob is the best option. A SQUARE jawline needs softness. 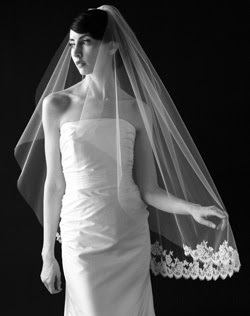 Face-framing tendrils will help torelax a strong jaw, and a longer veil will work better than a shortwide one. Many people consider a strong jawline a striking feature, andthe confidant bride will want to show it off. If you have an OBLONG face, complement it with a bit of width. Look forwaterfall veils paired with a wide tiara, wreath, or bun wrap. Stayaway from piled-high hair, which will only make you look moreelongated. If your face is HEART-SHAPED or TRIANGULAR, you'll want to add width atthe jawline. Since most veils will be too full for you, the best choiceis a back piece, where the width shows up behind the neckline. As forhair, a chignon or flipped-up bob is a great look. A RECTANGULAR face will benefit from softness too. Don't be afraid to try more voluminous veils, the poofy quality will make your face look more symmetrical. Paired with a sideswept updo, you can't go wrong.